Life got a little more hectic this week. In a good way of course. Now that Logan is home I’m being pulled in 4 directions instead of 3. I’m still trying to work some so I can take off more when all 3 boys are home finally. But it’s going really well. 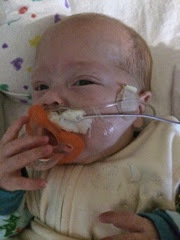 (If you missed it, I posted about Logan’s first few days home here.) Needless to say, I’m a day late posting this week. That may be a good thing though because I got some more news to report though. 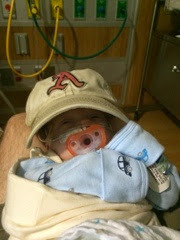 Mason and James are still in the NICU. It’s starting to get to me. I don’t know if it’s because we’ve passed the 100 day mark or if it’s because I know what I’m missing now that Logan is home or if it’s because we’ve been in the NICU longer than almost everyone else there right now or if it’s none or all of these things. But what I do know is that I’m ready for my babies to all be home. 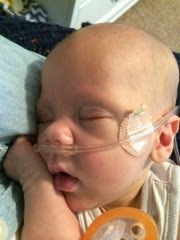 We had the greatest day ever last Wednesday with Logan coming home. I can’t even explain how happy we are to have him here. 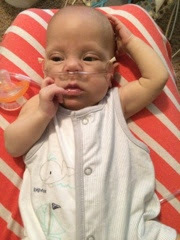 That makes the struggles from the NICU this week even harder though. We’ve had some steps back this week. But also some triumphs. Good news all around – all 3 boys had eye exams today and they all graduated! That means that the blood vessels are fully grown in their eyes so thier ROP (retinopathy of prematurity) will not progress and they don’t have the risk of retinal detachment. They just have normal preemie eye risks like near-sightedness (like lots of people have). Yay! And Mason and James moved to big boy beds yesterday. They were getting too big for the little plastic bassinets and Brian was worried James would throw himself out of it! Mr. Mason has had an up and down week. Last Thursday his blood gas wasn’t good so the doctor took him off the oral feeding pathway and decreased him to only 4 oral feeds per day. (The oral feeding pathway allows the baby to dictate when he increases his oral feeds. Because Mason’s gas wasn’t good, he doesn’t get to do that and he goes up only when the doctor writes an order for him to go up). But his gas was better Monday so she moved him back to 6 feeds per day again. Mason is very opinionated when it comes to eating. He’s doing great with bottles. No problems. Breastfeeding is another story. Mason either fights me and then goes to sleep or he does great. No middle ground with this guy. I’m hoping he doesn’t give up on breastfeeding! Ready for the good news? It has to do with the “h” word. IF (that’s right all capitals) Mason has a good gas Thursday he can go to full oral feeds. Then IF (all caps again) he takes all of his feeds AND (more caps) has no other issues, he may go to the place we don’t say out loud (you may prefer to call it the zoo, Disney, or McDonald’s) on Sunday! Mason is notorious for having bad gases though so I’m optimistic but trying not to get my hopes up! Mason weighs 7 lbs. 8 oz. now! He weighs the same as James (but James took his time getting there)! Logan has spent most of the last week at HOME! After a brief adjustment period (of 1 day) Logan has done really well. 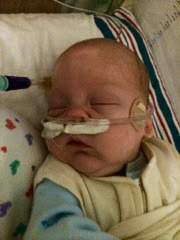 I just posted about Logan over the weekend (Logan is Home) so I’ll just give a brief update on Logan. 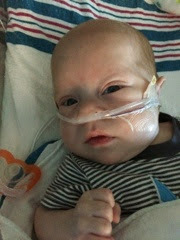 Logan went to his first pediatrician appointment on Monday. He weighs 6 lbs. 4 oz. (up only 2 oz. from his discharge weight) and looks great. Logan also had an eye appointment today. As I said above, his eyes look great and he graduated! We had some issues with the pulse ox monitor going off all the time so we talked to our neonatologists and ended up increasing his flow to 1/2 liter. That has helped tremendously! Now we can actually sleep! Logan has been out of the house several times since he came home. Mostly just to visit his brothers. So far he loves riding in the Mann Van. And this morning I took Logan to the hospital by myself (with his oxygen and pulse ox monitor) because his appointment started at the same time as Addison’s school. I had no trouble so I’m thinking I can do this! Logan has decided he doesn’t like his crib during the day! He loses it if we put him in there! The good news is that he sleeps great in his crib at night. I think it may be because we swaddle him and turn all the lights off at night and we don’t do that during the day (?) so we may try that for nap time too. Also thanks to Logan we have already washed the carseat! I’ll spare you the details but I’ll just say my husband is pretty awesome for cleaning up the mess! Mr. James has had a rough week. His reflux is really bad. I can tell he’s hurting and it breaks my heart. I wish I could do something to help him. 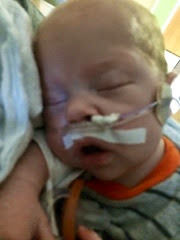 Unfortunately all I can do is hold him and make sure his nurses know what he likes and doesn’t like. James took a pretty big step back this week. 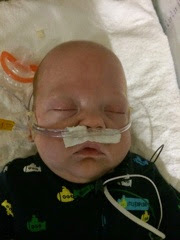 His gas was bad on Monday so he’s back up to 2 liters on his oxygen (insert frowny face). Hopefully if his gas is better on Thursday he can go back to 1 liter. His doctor told me it may take “a while” to get him better. I asked what “a while” means and she said a few weeks or a month. 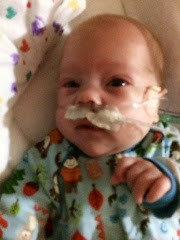 I’m thinking James will stay in the NICU for at least another month. He hasn’t even gotten to the point where he can even start attempting oral feeds. James also started blood pressure medicine this week for hypertension. His blood pressure was higher than mine! The good news is that the meds are working. We think his chronic lung disease is causing the hypertension. (Babies usually have secondary hypertension, meaning that something else is causing high blood pressure). His doctor ordered a renal panel and checked his kidneys and everything came back normal so that’s good news. Addison started school today! 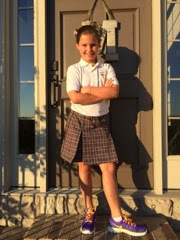 5th grade! I can’t believe she’s that big already! 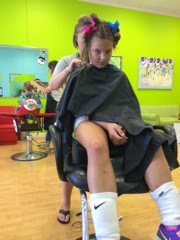 And here’s Addison getting her back to school haircut. She’s not happy with me! If it were up to her she would never get her hair cut. So this once every year haircut (and only trimming off the dead ends) is torture! 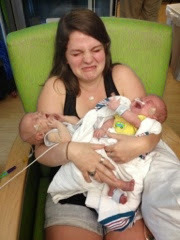 This entry was posted in Addison, Family, NICU, School Days, Triplet Milestones by Angela Mann. Bookmark the permalink.